Several other new recordings of Liszt, Mahler # 2,Bartok quartets,Tchaikovsky "Queen of Spades " , others, as well. I have both the Arrau and the Zimmerman, and agree both are good. There also exists a 1945 STEREO recording with Gieseking/Rother recorded in Berlin. It's the only complete work the Nazis happened to record in stereo on magnetic tape before the regime fell, with limited fidelity, but the sound is quite advanced for its day and is distortion free. In the quieter moments of the first movement, you can hear Russian artillery firing in the distance! Unbelievable. And Nicholas Kenyon is someone to be taken very seriously - ordinarily. This is a big performance. It's also a bit old-fashioned, with some rolled chords that wouldn't pass today, but I don't mind. I have his book on the piano repertoire but never thought of him as a solo pianist himself, which he certainly was. Glad you found this and provided the link. Glad you enjoyed. So many today are non-descript. Hutcheson’s is great. Yes, I have that set, Brian. It is really fine. One of the first versions I really loved was the Leitner/Kempff, and later I got to love the Van Kempen, which might be more poetic, but less "authoritative". I'm sorry to say, I don't really know the Peter Raabe. I didn't play it when I got the set because I was put off by the 1941 date of the recording. Have you listened? Not just promising, extraordinary, because Rubinstein and Toscanini never performed that concerto together. Their one collaboration was in the concerto no. 3 in C minor, published by RCA Victor. Though Toscanini conducted the Emperor Concerto once, with Horowitz and the New York Philharmonic in 1933, no broadcast recording exists. I wish it did! By 1941, Germans had been using magnetic tape to record their radio programs as well as music for nearly a decade, IIRC. Yes, I would recommend that you listen to Kempff's 1941 restored Emperor, as the sound is quite superior for its time. 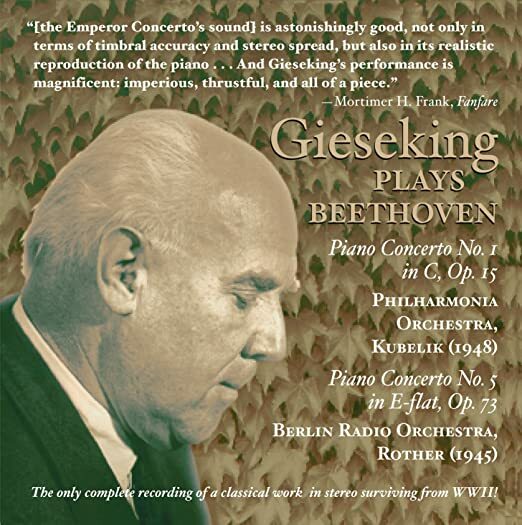 I also recommend the 1945 stereo Gieseking mentioned above. You are quite right, John. I just checked, and it is indeed the third concerto. My apologies. How about I listen to that instead. I may be wrong about this, but I believe the Magnetophon was used only by the German Radio, not the German record companies, which continued recording direct to disc until after the war. Can't find a reference to settle this one way or the other. 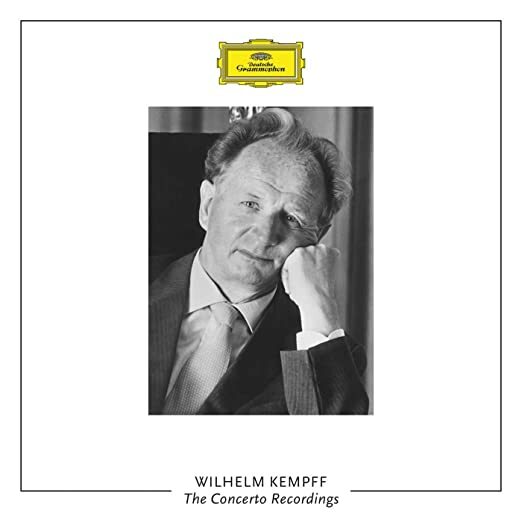 Of Kempff's Beethoven concerto recordings, I like the monaural versions with van Kempen best. Kempff's playing seems to me warmer and more spontaneous than in the stereo remake. I haven't heard the earliest recordings on 78s. I have so many Emperor concertos that I am ashamed to say how many. I love the work. It was the most listened recording on LP by me when I was very young. And, of course, there are many grand recordings of it. Rubinstein has recorded it commercially on three occasions, and, as great a pianist as he was, he was never given enough credit for his Beethoven. His Chopin always won out. For me, Rubinstein made one of the most convincing recordings of the Emperor with the Symphony of the Air under Krips. The other most striking and memorable performances were by Solomon (EMI), Gould/Stokowski (for something quite off the beaten path, but still has something to say), Serkin, Casadesus, Fleisher, and of course, many present-day pianists. If a recording by an artist is going to be engraved just once, then trying to locate the performance for the desert island might be an easier task than you think. Artur Schnabel, too, as well as Edwin Fischer immediately come to mind. However, the blessing we have is that we can have as many as we wish on recording (and can afford), thus experiencing a wide array of interpretations of the same piece of music. Hi John - and YES, I did and was impressed with Hutcheson. It was impeccable playing and truly had something to say. Do you know if this ever appeared on a CD? I have Donald Isler's/KASP DVD of Hungerford playing Beethoven's Fourth Piano Concerto and hope to spend some time with this soon. 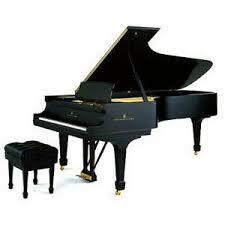 Like Australian singers, the country has also given us a number of superlative pianists. I don't know whether the performance has been published in any form other than on YouTube. But my guess is that somewhere it has been - otherwise, where did the uploader find it? Maybe someone at the performing arts library can tell me on Friday, though they don't have it in the sound archive. Keep scrolling down the page - it's endless, and some of the most remarkable items are well down the list. The uploader, Mark Ainley,has a website, perhaps a blog as well, is an expert on late pianist Dinu Lipatti, and I believe has contributed assistance on several historical recordings of various pianists for various labels. The Rubinstein/Krips " Emperor ",ca.1956,is one of my fav recordings of the work ( along with Hutcheson's, and Serkin/Bernstein ). Rubinstein "breathes". In fairness, # 3 is a very different work. I also have the Rubinstein/Toscanini # 3,and Rubinstein may have wanted a darker sound,less rubato.The LvB 3rd is my least fav of the LvB PC's, although still a great work. Last edited by Rach3 on Wed Feb 13, 2019 7:08 pm, edited 1 time in total. Ainsley has gotten hold of many unusual and unpublished recordings and names his sources for some of them. No doubt the Beethoven concerto with Hutcheson has a similar source.